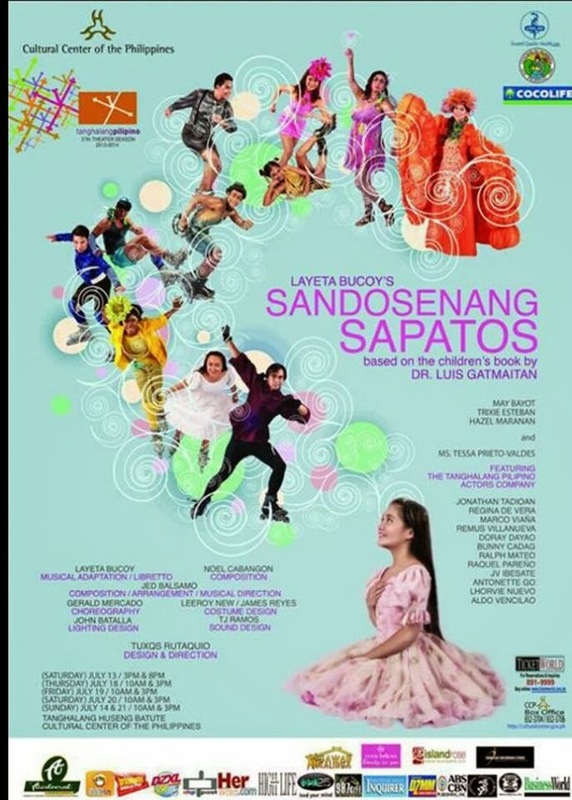 Tanghalang Pilipino’s Sandosenang Sapatos is having its second run from December 7-15, 2013 at CCP’s Tanghalang Huseng Batute. Co-produced with the Cultural Center of the Philippines in coorperation with the City of Marikina under Hon. Mayor Del De Guzman, the play is written by playwright Layeta Bucoy; a musical adaptation of Dr. Luis Gatmaitan’s Palanca award-winning book of the same title. Sandosenang Sapatos is directed by Tuxqs Rutaquio with Noel Cabangon and Jed Balsamo as music composer and arranger, TJ Ramos as sound director and Gerald Mercado as choreographer. More info about this musical from Sandosenang Sapatos' first run. Tickets available at all TicketWorld outlets. Call TicketWorld at 891-9999 or contact 0917-750-0107 for more details.